The Sub12 is a powerful subwoofer designed to extend the low frequency capabilities of any near or midfield monitoring and is an ideal matche for ADAM monitors such as the AX- or the SX-Series. 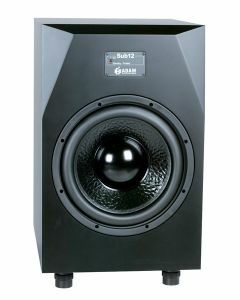 The ADAM Sub12 is a powerful 12” subwoofer, well-suited for use in larger control rooms. It provides a frequency response of 22-150Hz capable of extending to a 3dB higher SPL max output over the Sub10 Mk2 and features rear-panel gain control and filter adjustment. The Sub12 reflex tubes fire in a downwards direction, avoiding noise due to the size and ventilation construction of the unit. A large 2” voice coil is powered by an internal 200W Ice power amplifier, which stays cool thanks to PMW in the amp and power supply sections. This enables the ADAM Sub12 to easily manage maximum power without sustaining damage of any kind whilst operating at >90% overall efficiency. The woofer’s paper diaphragm allows for unrestricted bass reproduction for low fatigue operation, even at high volumes. An additional output means the Sub12 can be cascaded with as many subwoofers as required – a convenient option for building a double bass array. The ADAM Sub12 offers both XLR and RCA (cinch) connectors for compatibility with almost any system. All subwoofers up to the Sub2100 feature a number of controls to adapt to different room acoustics and requirements. All units have a level control that varies from -60dB to +6dB, a phase ±180° switch and variable upper frequency barrier control (50-150Hz), a switchable 85Hz high pass filter for the satellite output. In addition, there is a ‘signal-on/continuous’ switch. This provides the option of automatic power up whenever the subwoofer receives a signal and automatic power off after 15 minutes of no signal.